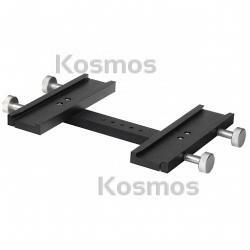 Narrow Side-by-Side Plate, Kosmos Scientific de México, S.A. de C.V.
With an Orion Narrow Side-by-Side Plate you can easily mount two telescope optical tubes to a single mount. The Narrow Side-by-Side plate attaches to an EQ mount equipped with a narrow, or "Vixen-style" dovetail saddle, and accepts optical tubes outfitted with a narrow dovetail mounting plate. You can also mount an optical tube that is equipped with tube rings attached to a narrow dovetail mounting plate. Having two telescopes mounted side-by-side is a great way to expand your visual observational abilities. You can, for example, attach one telescope optimized for wide-field views and another for high magnification use. Once you have the mount trained on a target object, you can alternate between wide-field and high-magnification views by looking through the two different telescopes. Imagine going to a star-party and showing off a powerful view of Jupiter's red spot region through one telescope AND a wider view of Jupiter's disk and bright moons through another telescope on the same mount - talk about a crowd-pleaser! For astro-imaging pursuits, an Orion Narrow Side-by-Side plate allows you to mount an imaging telescope and guide scope next to each other instead of in a "piggyback" orientation. This can help reduce tracking errors and simplify your astro-imaging setup. What's more, you can easily swap out telescopes when using a Side-by-Side Plate if you wish to change your imaging or guide scope instruments in the middle of a lengthy imaging session. Using a Side-by-Side Plate can reduce the amount of counterweight needed, since both mounted instruments are closer to the mount's pivot point compared to telescopes mounted piggyback. The distance between the two plates is 9 inches. The Narrow Side-by-Side plate measures 11.5 inches wide. Each narrow dovetail saddle measures 9 inches long and 2.5 inches wide. The entire assembly is 1.5 inches in height and weighs 3.85 lbs. Two telescopes are better than one, and with an Orion Narrow Side-by-Side plate you can enjoy two telescopes on one mount!